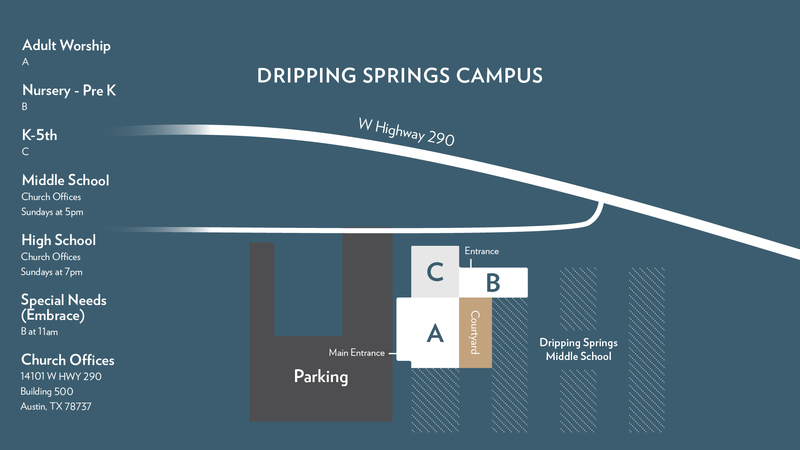 Austin Ridge offers Sunday services at three campus locations in the Bee Cave, Dripping Springs, and Southwest Austin communities. Our lead pastor rotates teaching at each campus, so when he is seen live at one campus, he is featured simultaneously via satellite at the others. Each venue features live worship. We recommend arriving 15 minutes early, so you'll have plenty of time to find a parking space, check-in your kids, or grab a cup of coffee. From the moment you arrive at Austin Ridge, there will be smiling faces to direct you! If you're new to Austin Ridge, we'd love to meet you! Please stop by the Connections Desk in the lobby following service, where our pastors, leaders, and greeters are available to say hello and answer any questions you may have about our church.